I was inspired to write this book by watching Japanese anime and reading Japanese manga novels. I am a great admirer of Japanese culture, and always wanted to write an urban fantasy story set in modern day Japan. My interests are diverse and they include military history, coin collecting, art, movies, science, philosophy and writing. I try to get inspiration from every possible source and enjoy writing books for fun. Demon Heart 2: Never Say Die by David Crane is urban fantasy with a great setting in contemporary Japan, a story that features characters that are as sophisticated as they are mysterious. 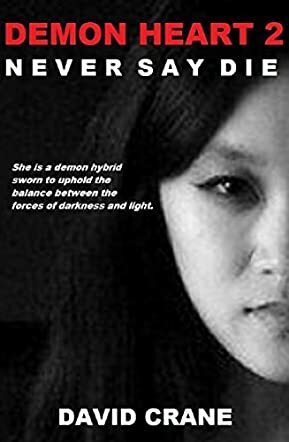 Meet Naoko Kitamura, a demon hybrid, the offspring of a union between a sixteenth century samurai of noble birth and an ancient female demon. She has just sacrificed her life and saved the city of Osaka from a terrifying nuclear threat. Yet she has to come back, but coming back to life isn't as easy as one imagines. Naoko moves to Tokyo where she intends to live under a new identity, she falls in love and starts a new family while continuing to work for the Katana, a covert organization that protects Japan from both natural calamities and man-made threats. In an investigation into a new technology that can control human will, Naoko discovers the Yakuza, a criminal organization that is collaborating with the Russian mafia and an evil demon hybrid. Follow her journey as she meets incredible enemies and battles an evil that is far more powerful than anything she’s ever known. Does Naoko have what it takes to fulfill her destiny? This is a beautiful narrative and I enjoyed the complexity of the hybrid character, the heroine of the story. David Crane raises questions that actually kept me thinking as I read the story. Can a demon desire the good of humankind? Naoko can tap into either the darkness of her demonic source or the light of her human ancestry. She is sophisticated and her humanity comes across well in the narrative. The setting of the story is beautiful, and the author allows the cultural and social tenets of the Japanese to shine in the story. I also enjoyed how the author brings this into the story, exploring at the same time the themes of family, war, friendship, purpose, and a lot more. Demon Heart 2: Never Say Die is cinematic, filled with powerful images that readers will definitely want to watch on screen. It is a gripping tale of the struggle against good and evil against the backdrop of contemporary realities — top-notch technology, nuclear threats, and the quest for power.